Floods and landslides have killed at least 40 people in Vietnam and 42 are missing, officials say, and elderly wooden houses inundated at a world heritage site are in danger of collapsing. The floods, sparked by torrential rains from Typhoon Muifa last week, have submerged 170,000 houses in five provinces and destroyed roads, cutting food relief to many areas. Thousands of people have fled their homes and an official said on Monday 270,000 people in just one of the affected provinces needed urgent help. Officials said they had not been able to get relief supplies though to the mountainous district of Tay Tra, in Quang Ngai province, for four days due to landslides. "We tried, but the road is blocked. Helicopters can not land," said a provincial official, who added that more landslides were feared. Scores of low, tile-roofed houses in the town of Hoi An in central Vietnam, declared a world heritage site in 1999 by the United Nations, appeared ready to collapse, state media quoted a local official as saying. More than 500 houses in the 16th-century trading centre had been submerged in waters up to 2 metres (6 ft) deep. "The quality of 83 old houses has worsened seriously. They could collapse any time," Le Van Giang, chairman of Hoi An town People's Committee, was quoted as saying. Thua Thien Hue province officials told Deputy Prime Minister Nguyen Tan Dung, who toured the flood-hit area on Sunday, that 270,000 people needed urgent help. Weather forecasters said slight rain was expected on Monday in the Central Highlands coffee belt. No flood damage has been reported there but the rain could disrupt harvesting. Vietnam is the world's top producer of robusta coffee. Having skirted Vietnam, Typhoon Muifa, which killed 61 people in the Philippines, weakened into a tropical storm and went into the Gulf of Thailand last Thursday. 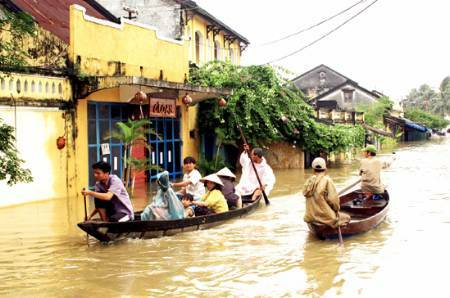 Seven to eight tropical storms hit Vietnam each year and usually trigger flash floods in the central region. In October and November last year nearly 100 people were killed in floods.